Gone are the days of traditional advertising in newspapers and billboards and in are the days of search engines and online maps. But how can you get site ranking high enough to attract patients? The work behind getting your site ranking or search engine optimization (SEO) can be very technical and time consuming. But there are small things every practice can do that make a big difference. 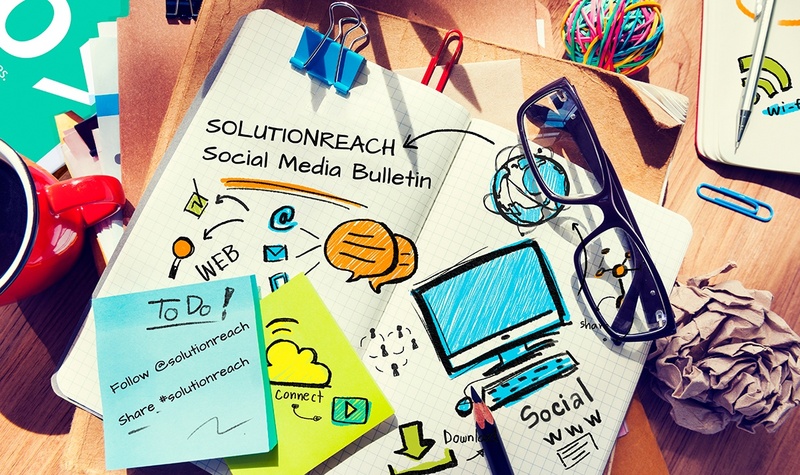 Here are six easy DIY ways to get your site ranking higher. 1. Google+ set up and posting: This one always makes me laugh. 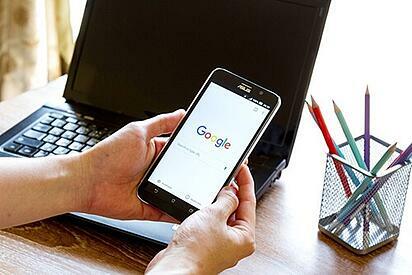 How many people use Google+ to search for a healthcare provider? Not many—if any at all. But Google pulls a lot of the information from your Google+ account into their search results. 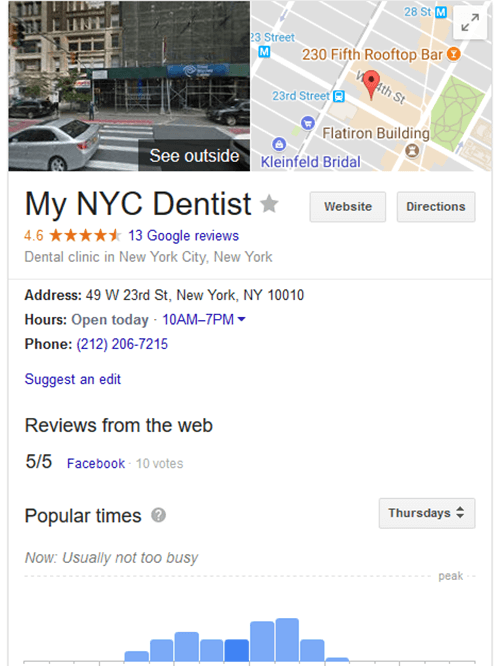 For example, I searched at random for a Dentist in New York City on both mobile and desktop. Nearly all of the information that showed up in my search was taken directly from their Google+ page. If you choose to not set up a Google+ page, Google will create one for you. This page coulde be riddled with incorrect information from poor sources. Google will also reward your site for having Google+ set up with all of the correct information and for occasionally posting. This is an easy first step that can make a big difference. 2. Patient Reviews: The more the better! Studies show that 77% of patients use online reviews as their first step in finding a new doctor. Not only do reviews help you gain the trust of new patients, but it also is a major ranking factor for Google. Review quality, quantity, and diversity play a role in ranking your site higher in search engines and in maps. There are many great software programs that send out automatic reviews after visits. This allows patients quickly leave reviews to Google, Yelp, and Facebook. The easier you make it for patients to leave a review the more frequent and greater quantity of reviews you will receive. 3. Content on page: You may have heard the terms H1s, Meta titles and descriptions. These are all elements of each webpage on your website. More and more, the content you put on your site has become the most important factor in where you rank. Notice that you can use a variety of different ways to target your keyword. The words dentist, dental, dentistry and emergency and accident will all work. You don’t have to write the same keyword in the same way throughout your whole page. In fact, doing so can seem robotic and turn people away from visiting your site. In the past it was advantageous to stuff your keyword in as much as you could in the content of the page, oftentimes being over repetitive. So when a practice was trying to rank for the word "emergency," they might write this..."Emergency dental that serves all of your emergencies at any time for any emergency." Using the word emergency three times in one sentence is obviously overstuffing and search engines are now able to recognize and might even punish your site for using these overstuffing techniques. Make your content feel natural. 4. Personalize your Site: Make the site your own. Free feel to bring out your offices unique personality and feel. Don’t use your site as just a dump of information, think of it as a way to connect with patients and tell your brand’s unique story and the benefits you can offer them. This step has two main advantages for you. First, it will sell clients on your office, making it easier for them to come in. And second, it will create more interactions with your site, more social media likes, more time spent on site, etc which helps with the next step, user experience. 5. User experience: The more interaction patients have with your site, the better your site will rank. Interaction includes things like how much time users spend on your site, if they visit multiple pages, if they click to call on their mobile devices, your click through rate (how often people click on your site when they see it) and social media interactions (likes, comments, shares). These interactions all matter in getting your site ranked higher. Search engines are trying to rank the sites the highest that people seem to use and interact with the most. 6. Online Directories: There are hundreds of online directories like Yelp, Yellow Pages, BBB, and other sites that host business information about you. Search Engines crawl all of these sites to gather information and create a profile of all of these sites linking to yours. The more directory sites your information is published on, the better. Be careful here. If you have small differences from one site to the next (using Street vs. St., for example), the search engines will view these as separate addresses and dock your rankings. Be careful to have all directory sites submitted with the same spelling and format. There are also tools that will submit all of your information out to hundreds of different directory sites and suppress any duplicate or incorrect listings. These create quality links back to your site, ranking it higher. Ranking your site higher on search engines takes time, so be patient and don’t expect that these steps will change everything overnight. 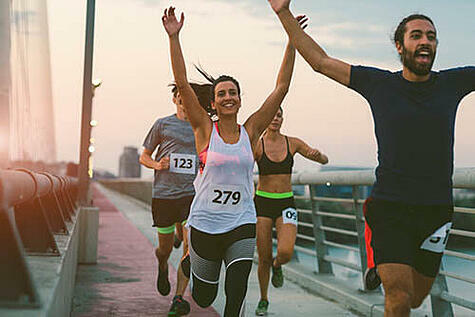 Remember, SEO is a marathon, not a sprint. But by doing these simple tricks, you are taking the first steps in earning that online traffic and reaching new clients every day. And unlike traditional advertising, once you have a great ranking spot, its not for a limited time and won’t cost you crazy amounts of money. Interested in attracting more patients? Read the 10 Ways to Attract New Patients and Keep the Ones You Have. Briton Page was born in Britain (he had such clever parents!) and raised in the U.S. 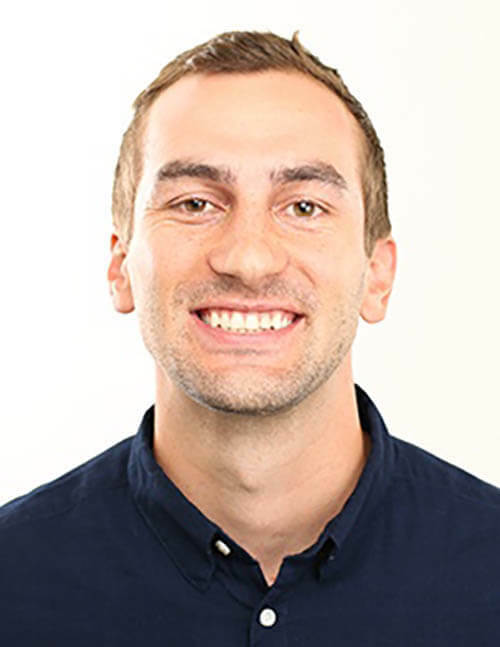 He graduated from Utah State University and has spent the past few years as an SEO and PPC expert. Briton is no stranger to the healthcare industry. His father, grandfather, and uncle are all dentists so he has an intimate understand of the ins and outs of healthcare. He currently uses his skills to help Solutionreach revolutionize the relationship between patients and practices.